^ "The Archaeology of Ontario-The Middle Woodland Period". Ontario Archaeology. Archived from the original on 15 July 2009. Retrieved 10 July 2009. ^ "Domain Default page". Sheshegwaning.org. Retrieved 2012-08-31. 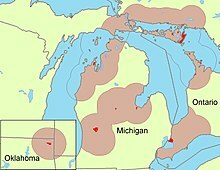 ^ "mackinacbands.com". mackinacbands.com. Retrieved 2012-08-31.